He wrote her five notes after they first met, and when she was in the bath, he hid them around her house – behind a painting, under a rug, in the toe of an old tennis shoe. She found them one by one over the years. Notes of love, recalling the heady rush of newness. “In the library,” he said eventually. Every day she took down a book and flicked through its pages; and finally, one afternoon, a scrap of folded paper fluttered out. I’m flattered this week that Rochelle chose a photograph of my libary at home. My piece this week is based on a true story. My partner Tim and I did write notes to each other and hid them in each other’s houses. We live together now, and I know that there is one final note in a book, that I’m yet to find. This piece of writing is part of the Friday Fictioneers writing group. Each week writers from around the world attempt to write 100 words (or so) starting with a picture. I’d love to receive comments and constructive criticism. Click here to read other people’s stories inspired by this picture or to join in, with the group hosted by Rochelle Wishoff-Fields. Claire, what a beautiful story of love. If Bill had done that for me (hidden them in my books), I might still be looking!! Of course, many of my books are in boxes so the task of searching for the note would be even more difficult. My dream is to one day have a room that can serve as a library for my thousands of books! Thanks Janet. We are very lucky to be able to have all our books out – in the dining room, but we’re already running out of space. It’s vinyl on the bottom shelf, some art books and cookery above those, and then biography and film (fiction is mostly on the opposite wall). So you may well have spotted a book on sculpture. So romantic, the idea of hiding notes in those first months, while you’re all loved up! The library is beautiful, and so is the story. Thanks Trudy. Still pretty loved up – ridiculous at 46! Ha! Age has nothing to do with it – I hope ! Maybe you should write and hide some deliberately – could be fun. I think this is a sweet exercise that sounds so romantic. I have thought about doing this, but alas have never set out to make it happen. Just do it! It is a lovely thing. Thanks for reading and commenting Joe. Thank you for sharing the personal story behind this writing; it adds so much to the reading. Very beautiful story (and photograph). Thanks, glad that you enjoyed them both. I feel very lucky that chance and circumstance (and your writing down through the months) led me to read this story. I will remember it forever. Thank you. That last note is being written and read every day by both of you. Amazing, Claire, just amazing writing. Aww, thanks Doug. You’ve made my day. Lovely story, and I hope you are searching for that final note too. And thank you for the great picture. I must say I’m a little envious about your library. I am looking, but there are a lot of books, and somehow I want to savour it for a little longer. The library is actually the dining room, but it is great to be able to have all our books out. Sweet tale, very well told. Thanks, glad you enjoyed it. We are very lucky. This is a great idea. To find something unexpected that makes you smile and be happy to be alive. Very nice! Thanks Honie. Most of my stories are pretty bleak – so this one made a nice change. Yes, that’s a fun exercise too. A wordy treasure hunt. I don’t have a kindle…yet, but I’m not sure I could ever do without the physical things. Or even notes to yourself to find years later about how you’re feeling now. Glad you enjoyed the story and the photo. Thank you for sharing your library with us. I hope you eventually find your love letter. I posted one story and have another in the wings for this week. I just started with this group more or less. And it is so hard to read everyone every week. I’m trying to read everyone this week in order! Again thank you. Cheers. I can no longer read everyone’s story – there are just too many. But I’ll come and take a look at yours. Thank you so much for sharing your lovely photo and your delightful story. I enjoyed them both. Thanks Rochelle. I appreciate you visiting – it must be quite a task with so many people joining in FF now. this is a wonderful story, and made even more wonderful by the fact that it’s true! What a brilliant idea to capture that first heady state of love and hide it away to remind you in the future. I’d almost be sad to find the last note though. Actually, that’s why I haven’t really been looking that hard – I want to delay that moment. Perhaps when I’m 80 I’ll find it. Claire, what a beautiful, romantic story. I wish this would happen to me. This is romance at its best. Aww. He is a bit of a romantic, my Tim. Good concept! Has that feel of Nicolas Sparks to it, which ain’t bad, really. Good work! I don’t know Nicolas Sparks – I’ll go an look him up. Such a lovely story and take on your picture 🙂 nice one. Thanks Bill. It is a lovely space to hang out in. I promised my wife our next house would have a room with all bookshelves. I have to know — do you have a favorite ? A favourite book, do you mean? I do. At the moment, without doubt it’s ‘We Have Always Lived in the Castle’ by Shirley Jackson. Do you know it? Do you have a favourite? It’s funny, when I was very young I read Herman Hesse’s “Siddhartha” and thought it was the most amazing book. Many years I revisited it and laughed out loud. It shows how we can change. I think the most beautiful book was “A Wizard of Earthsea” by Ursula LeGuin. I read it aloud to my girls. and the Tolkien “Lord of the Ring” is like a cherished friend who I re-read sometimes like a chat with a friend. Lovely story, all the more meaningful because it is your library. I probably wouldn’t have found the first note yet! Beautiful! Made even more so by the fact that it is based on reality – a wonderful reality I hope you enjoy! Thanks Claire for the photo – it’s so colourful and cheerful. I love your story, even more so because it’s based in truth. Good luck on finding that last letter. Books always look lovely. I’m trying to delay finding the last letter really. Thanks for reading and commenting Sarah Ann. I won’t lie, I’m a little jealous. It’s a wonderfully romantic idea. I’ve been hanging around fresher uni students so long, I’ve forgotten what romance looks like! Surely even fresher uni students can be romantic. No? Perhaps not. What a sweet story, Claire. Sometimes Connie writes on my napkin when she packs my lunch. It’s always nice to come across one of those notes when you least expect it. Oh, that’s really romantic, and lovely. Glad you enjoyed my story. What a wonderful tale of love. So romantic. It leaves me to wonder if the book holding the note held any special meaning. It probably does, but I haven’t looked too hard for it, I want to savour the moment. We have similar libraries. I will post some photos of mine. Lovely romance. They have grown old together. I’m glad you didn’t reveal the contents of the final one. A bit of mystery. And we can dub in our version anyway. I did think about including what the letter said, but apart from the word count issue, I think whatever I wrote might not be ever as good as what readers can themselves imagine. Sometimes less is more in writing, don’t you think? Looking forward to seeing some pictures of your library. Send me a note to let me know when you’ve posted them. 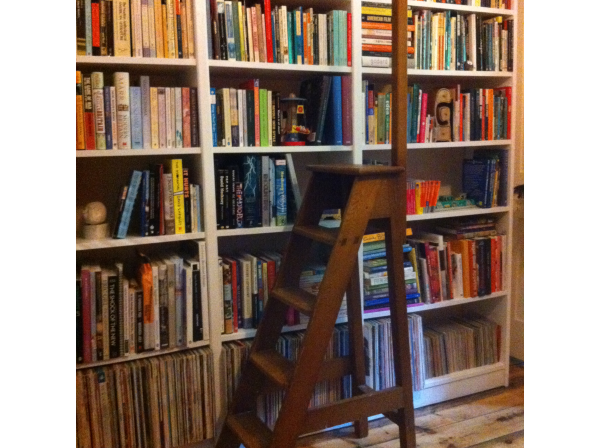 Hello Claire, I’ve just posted some photos of some of my library – the main ‘hoard’ as I’ve called it. Yes, less is more in writing sometimes. It’s very hard to achieve. That would be a lot of books to go through, although I guess it’s a good excuse to reread them all. 🙂 Great photo, by the way. Thanks David. And that’s just one wall – there are two more full of books. I’m going to be about 80 when I find the note. It’s always nice to hear what the photographer makes of their own prompt, and especially nice that it is based on fact. Sometimes we don’t have to look too far for a great story. You’re right. This one came to me very easily. Thanks Anne. This is the best story I’ve read this week, Claire. And, that’s no bull. Ted, that’s a lovely thing to say. Thanks very much. Dear Claire – Thank you for this colorful photo of your own personal library and the lovely, tender story about hidden love notes. And to think it’s true!! Very touching. Thanks Lora. As Anne said in her comment, sometimes we don’t have to look too far for a story. Thanks Lily. So pleased you enjoyed it. How romantic and I love that you shared your library with us. I zoomed in on the books too and didn’t think of it as discourteous until someone else apologized lol. Doesn’t it kind of feel like you had the Fictioneers over to your place? Thank you for sharing. And as I’m telling a lot of people this week: I would have liked the story but for some reason my like button is not loading. Please consider yourself “liked”! I don’t have any issue with people seeing what books we have on our shelves – it’s a nice way to get a good conversation started. And yes, great to have all the Fictioneers over to dinner this week (the library is also the dining room).